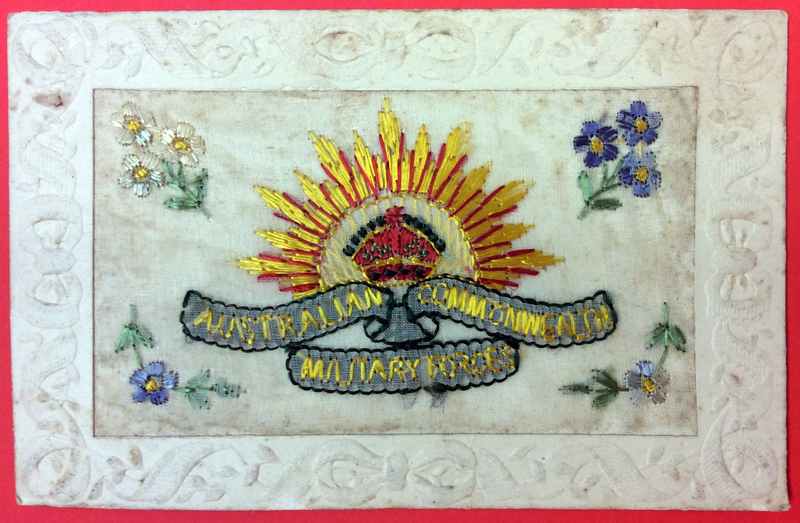 Above: Postcards from Rozelle Soldier Charles Reynolds to his English wife. 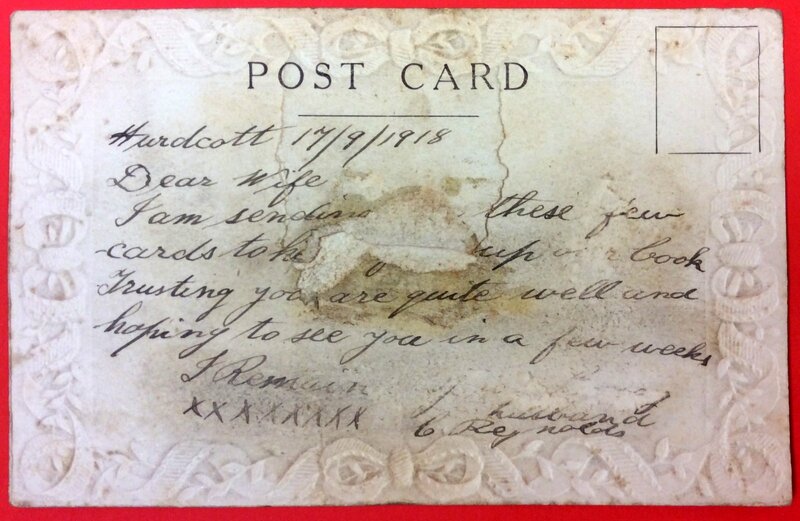 Woven silk postcards were first produced in Krefeld, Germany in 1898 as a combination of printed postcards and large woven silk pictures, known as Stevengraphs. The early cards were woven on machines. Being machine made, the woven cards always maintained a high standard. 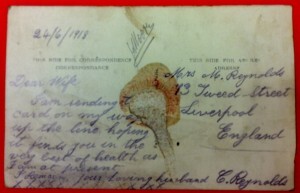 The popularity of silk postcards peaked during the First World War 1914 – 1918. A thriving cottage industry began around 1915 and the quality of the early silks was quite high. However later, to satisfy demand, the workmanship was often not quite as high. Postcard companies began to employ women to produce silks on a rough assembly line basis. 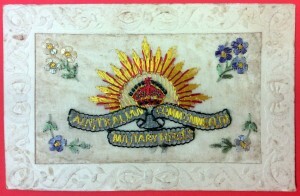 The cards were generally hand embroidered on strips of silk mesh with as many as 25 on a strip. They were mostly embroidered by French women in their homes and then sent to the factories for cutting and mounting on postcards. 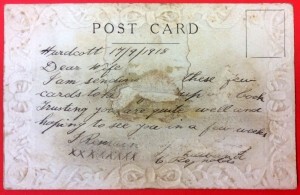 Some postcards were made with little envelopes which could contain a smaller card with a sentimental message. Production continued steadily through World War I, declining substantially in 1919, until ending around 1923. 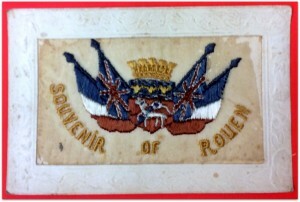 An estimated 10,000,000 hand made cards were produced from 1915 to 1919. 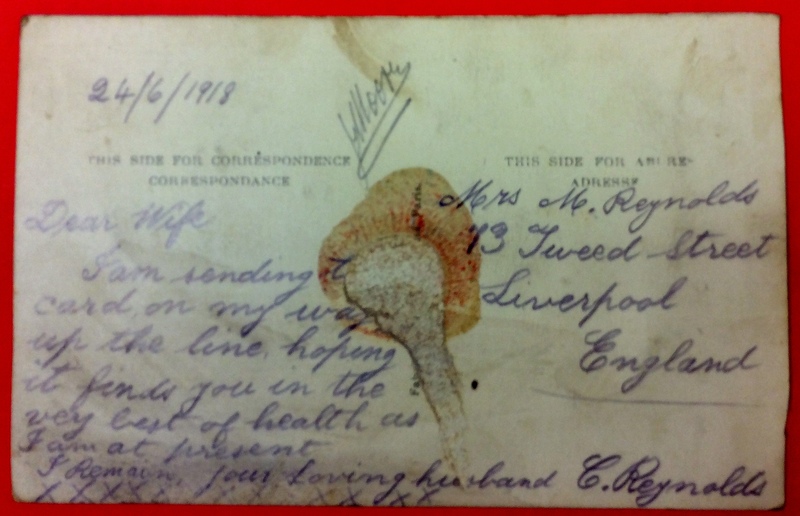 In the 1930s and during the Second World War, machine made cards were produced which were simpler and plainer and with less variations. They never gained the popularity of their WW1 predecessors.